Updated 05/04/2019 By Alyson Long. Any post on this site may contain affiliate links. If you use them, they cost you nothing extra. We make a small commission. I blog. Blogging is how I support my family. But what is blogging and what is blogging not? On a day when I’m struggling to come up with an idea for a new blog post I thought I’d go deeper into blogging. You probably all know me, my family, my style, but do you really? What is MY truth about blogging and how does it affect me, my family, our lifestyle and our privacy. The truth about blogging?- I live for figures, stats and data. All of these things are completely true, facts, but maybe they are just my truth about blogging because no two bloggers will ever do it the same way. I love blogging and to be successful you need to love it. When you first create your website or blog, you will make no money for several weeks or months. I made some good money in my first year but it was unpredictable, there were some great months, some months of almost zero income. You have to want to pick up your laptop and create content constantly. If you have to force yourself you will never get there, the sheer volume of posts you will need to create in order to make an income will quickly deter anyone with not enough enthusiasm. If I get a free moment I won’t watch TV or pick up a book, I’m straight to my website. Why do I love it? There are many parts to this. I started because I wanted to educate. I wanted people to know what the world was really like, to understand their options concerning their kids’ education, travel and lifestyle. I wanted more people to see that they have choices and I wanted to fight back at wrong assumptions about the world. I wanted to help and to make a difference. As we travelled more I started putting guides together and helping you in the HOW to travel. I do love that part too. But that’s not all. I love the technical challenge, I love the numbers, the data and the code. I love seeing my site, my creation, get bigger and bigger week on week. I love checking every day to see how much money I’ve made, there is a thrill in that which never seems to get old. I enjoy the photography, even though I’m no photographer, and I love making something. I made it, all of it. I’ve always been a maker with a strong ( but suppressed through being “scientist” ) artistic and creative side and the site satisfies that. I love it when we get amazing feedback from you guys. It is very much appreciated when you leave comments or send e-mails thanking us for helping you in some way. One made me cry this week it was so touching. You know who you are. But that’s not why I do it, I’m not chasing that and I’m not chasing fame. I think what I’m chasing is stats and numbers. The bigger the site gets the bigger the thrill. I don’t love writing. This has never been about writing. Today, for the record, we are sitting at about 270,000 monthly page views. We’ve had several days now of over 9,000 page views. That’s immense. The less money I made from blogging, the more I loved it. I started for fun. When I could sit down and write 300 enthusiastic words on what we did today it was easy, it was sweet, it was fun. Now it’s business and a post is more like 3,000 words. There is pressure. 3 summers ago I read The 4 Hour Work Week and that book, along with a shift within me, gave me the shove to take this site to the next level. It was when I had the brainwave about Living Differently and realised that we’d done it, we’d proved it was possible and that we were now the experts not the students. No, I don’t only work 4 hours a week and never will, but that book gave me a shove that I needed at just the right time. I try to avoid deadlines as much as possible because I don’t enjoy them, but the weekly news letter is a deadline I’ve artificially created for myself. It’s something of a trap and right now it’s bugging me. A blog is not a diary. Nobody would want to read my diary, I’m very dull. We don’t share every detail of our lives with the world, not even close. I share what I choose to share and mostly I just produce travel guides with a sprinkling of personal experiences. A blog is not a collection of stories. I think when the concept of blogging first came along, that was the idea. These days a blog is simply a website and unless it’s a hobby ( or occasionally a writer or photographer’s showcase) it is a business. Blogs exist to make money. There are various ways in which bloggers earn, from selling self-created products ( e-books and courses) to affiliate marketing, advertising and link selling. Some bloggers make more money from their social media channels than the blog itself in product promotions and placements. There are many, many ways to make a living blogging. A blog is not just a blog. Do you think writing a post, adding a few images and hitting publish is it? It’s not even close. Writing and publishing posts is maybe 10% of creating and running a successful or profitable blog or website. What else is involved in blogging? Well, there is keyword research, affiliate marketing, social media promotion, endless emails to send and answer ( clients, readers, business propositions), photos to take and edit, research on posts, constant data monitoring, improving old content based on that data, updating everything, managing and creating the site, its hosting and its advertisers. It’s not just writing stories. It’s not at all writing stories. You don’t necessarily need to be able to code, but it helps. Do you have to be good with all things IT? Not really, generally if you run into a tech related issue you can Google for solutions. I didn’t touch a computer in school, nor in university. I’m that old. If I can teach myself how to do this, easily, from YouTube and Google. So can you. So can your kids. Why are they in school again? The blog is the third child. I’ve been nurturing this baby for over 6 years now. Look how big it got and how beautifully it grew. There has been joy, there have been setbacks, there has been frustration, there have been tears. This blog did not come with an instruction manual, I had to figure it out along the way and found the best way for me, and my blog. You can make a lot of money blogging. Don’t believe those who say you can’t. Joining Mediavine was a huge boost to our income. Mediavine manages the ads on this site and the pay is very good indeed. More lovely data to analyse. 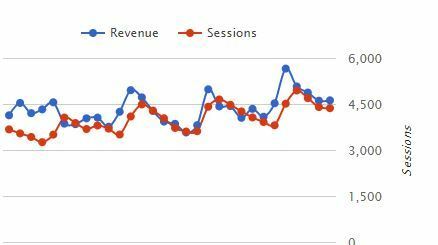 I aim for more quality traffic on the high revenue days. The sky is the limit. Work hard and know what you’re doing and you can almost print your own cash. If people try to tell you it’s impossible to make money blogging, either they haven’t quite figured it out or they’re not prepared to put the work in. If I spent as much time working as I did procrastinating I’d be rich. Sometimes, like today, bloggers run out of ideas. It’s hard to come up with ideas for posts to send out to the followers, you. I know right now which destinations I need to write up and which sales pages I need to create. That’s easy, it’s business and I make those choices based on Google Search Console, Longtail Pro and this need I have to create complete guides to countries. I’m a little obsessed with that. It’s the coming up with the more personal posts that becomes hard and I’ve resolved to try and get one out every week. This week I really struggled. Maybe next week I’ll have 10 great ideas. If you have suggestions PLEASE put them in the comments below. How Does Blogging Affect Us, My Family, Our Life. Obviously the website IS our financial freedom. Without it we wouldn’t have been exploring the world for over 5 years and we couldn’t call ourselves a nomadic family, digital or otherwise. But does it affect our day to day life? No, not really. Obviously I put a lot of hours in but there’s no hiding away in an office separated from my kids. If I’m working they are likely still in bed ( like now, it’s 5am) or sitting around with me, usually at “home”, which is quite likely to be a hotel, or if I have something absolutely vital that I MUST finish, I sometimes take myself off to a coffee shop. I honestly can’t remember the last time that happened. We don’t take lots of cheesy family photos, we create very little video, the kids aren’t really expected to perform in any way for the website. They’re not props. We do sometimes pick destinations because of the site, but it will be 50% business need, 50% personal want and also we do promotions sometimes. The last one we did was before Christmas and the kids had a ball ( video below). In terms of their education it all just slots together. There are no schedules or timetables but once this newsletter is ready to go I’ll be doing Boo’s latest physics class with him and that will take us off on a tangent to something educational, it always does. They are really into physics lately thanks to Big Bang Theory, praise be! Last night we watched some documentaries, tomorrow we’re visiting a historical attraction, it all just flows and fits without a need for scheduling. Schedules steal my joy. Are we famous? Well, we do get recognised, yes, but usually only in the places where there are a lot of family travellers. Otherwise, not really. It’s not a big deal and we love chatting to the folks who say hi. I doubt it. I can’t imagine stopping because it’s far too addictive. Being the woman behind the World Travel Family website defines who I am these days. I don’t want to stop being that person. Chef is getting more and more involved too. It’s taken me a while to get him working with me but I think he’s starting to see it as the family business not just my business. It’s changed my outlook, my self esteem and my self worth. I made this thing. I support my family in a creative and interesting way. I’m an “expert” on travel. I’m proud of that. I’ve wanted to travel all my life. I always HATED being stuck in a 9-5 job and restricted by working hours. I’ve got exactly what I wanted and do you know what’s interesting? A long time ago, on the eve of my first wedding, a fortune teller knocked on my door and told me this would happen. Everything she said has come true. Did she know? Did I create the reality she described? I have no idea. I don’t normally allow people to spam the comments section with their own websites and posts but I approved yours as I actually went and read your post and enjoyed it. You need to get off wordpress dot com and you need to improve your English but your points are valid. However, you can beat sites with higher authority if either you invest in serious keyword research and pick your topc carefully or your post is just so brilliant that it rises to the top naturally , just because it’s the one the people love best. There are many ways to beat sites with higher authority than your own. I would also say that getting Adsense set up RIGHT from the start is a very sensible thing to do. It’s a one-time set up and you’ll be making cash daily as you work on growing your content. It’s very possible to get off Adsense and switch to a premium advertising agency like Mediavine within months. 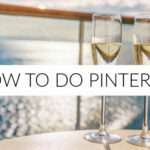 Some people do this just on Pinterest traffic, no SEO at all. So everything is possible if you just know what you are doing. May I recommend you sign up for our free blogging series? It could be helpful to you. Ill be sure to come back and read some more of your stories. Me, too, Jamie! I am just getting interested. I’m at ground zero with it all. My husband and I are planning to go on the road starting in 2023. We are giving ourselves 5 years to prepare and let our little ones grow up a little more for an easier traveling experience and hopefully make blogging easier too. What do you think? 5 years is a really good amount of time and it’s smart to wait until your kids are older too. Great article Alyson. Really needed to read this. This bit really resonated right now: “I’ve been nurturing this baby for over 6 years now. Look how big it got and how beautifully it grew. There has been joy, there have been setbacks, there has been frustration, there have been tears. This blog did not come with an instruction manual, I had to figure it out along the way and found the best way for me, and my blog.” My blog is definitely a work in progress at the moment! Sent you my vote – best of luck for the Award!! Our family is also thinking differently about our future. Thanks for all the info to help us on our way, particularly regarding schooling our young son. Cheers! Good luck on the blog awards. You earned our vote. Enjoy London.